“In a time of increased conflict around the world, it was refreshing to spend time with admirable young people from different faiths, beliefs and backgrounds who will be valuable assets to our society. It confirms my belief once again that the problem lies with our political leaders & not between religious believers. I pray we will grow to be more open, tolerant and exemplary members of society. Thank you everyone, it was a great pleasure!” Esma Basbaydar, participant to the study session “Say NO to Hate!”. 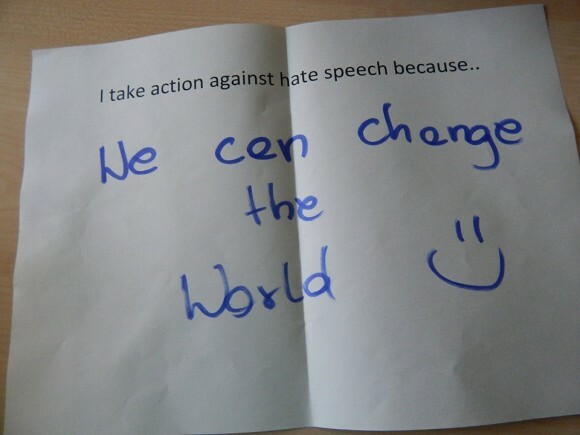 From 29th of June – 6th of July more than 20 young people form different cultural, religious, non-religious, social and geographic backgrounds gathered in the European Youth Centre Budapest (EYCB) for the study session “Say NO to Hate! Young people addressing hate speech from interreligious perspective.” The study session was organised by EYCE in cooperation with Religions for Peace – European Interfaith Youth Network (RfP-EIYN) and Forum of Muslim Youth and Student Organisations (FEMYSO), and was supported by the Council of Europe. The main aim of the study session was to empower young people from different religious communities to address and respond constructively to the hate speech in their own context. As a starting point to reach this aim, the participants looked at the terms and concepts linked to to the issue – hate, love, forgiveness and dignity – all essential to further discuss the definition, origins and consequences of the hate speech. Highlighting the interreligious perspective of the study session, the participants also discussed the role of the firth communities in supporting and spreading the hate speech or advocating and acting towards more inclusion and equality. The task of analysing religious texts was especially challenging as participants were asked to look critically at the texts form Bhagavadgita, Torah, New Testament and Quran in order to determine the context and message, as well as how open or hostile the messages were. Finally, a conclusion was made that the “cherry-picking” is an extremely dangerous tendency and that the believers themselves should work within and outside their faith communities to prevent misinterpretations, as well as themselves be a tool for interpretation and understanding the context. The guest speaker, Dr. AbdoolKarim Vaklil, offered a valuable insight into the framework within the society, which implies the difficulty of accepting “the other”. Through concrete example of Islamophobia he explained the necessity to constantly readjust and re-conceptualise the world or society how we see it, once a new movement emerges. The power/ rights are never given away by those who have it, it has to be taken and claimed, therefore it is always with tumult that the new movements get integrated. Dr. Vakil highlighted that when working against racism and xenophobia, one should look beyond at the negative images in media, but look at the images and types who are accepted. The racism and xenophobia can be manifesting through those as well, and it is much more difficult to fight against something that is accepted, being a background noise, not an exceptional incident. To enhance the particular skills in different responses to the hate speech, the participants could take part in two workshops each, offering skills in very practical approaches, i.e. analysing and responses of the political hate speech, in particular regarding the election results of European Parliament in 2014, advocacy and working with victims of the hate speech, as well as comedy and humour as a tool to respond to hate speech, responses to Islamophobia and creativity. The participants could apply some of the skills and ideas gained, when planning the follow up steps to the study session. Many interesting and inspiring ideas were shared and we wish the participants the best of luck in implementation! The week was highlighted by the special focuses on the religious traditions present at the study session, offered by the participants, explaining the beliefs and traditions. In addition, the local religious communities in Budapest were visited in order to explore the challenges they face regarding hate speech, xenophobia and inclusion, as well as the responses and initiatives taken. The study session was organised in the framework of the NO HATE SPEECH Movement of the Council of Europe!